This attractive semi detached property is in 'as new' condition and occupying a choice cul de sac situation with a spacious garden area to the rear. For the potential buyer it really will be a case of moving in and putting your feet up! The quality of finish and decor throughout is excellent with accommodation including 3 bedrooms (master ensuite), a well equipped kitchen with integrated appliances, a fitted utility room, spacious living room plus a convenient ground floor cloakroom. 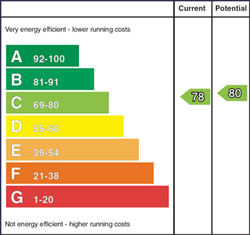 The property also benefits from mains gas heating and good insulation qualities resulting in a high level energy efficiency rating. As such we highly recommend you make an early appointment to view to avoid missing out on this superb property. 'As new' semi detached house. Attractive hardwood front door, telephone point, painted balustrade staircase with storage below and a separate cloakroom comprising a corner pedestal wash hand basin with a tiled splash back, w.c, and a tiled floor. Wood burning stove in a chimney style surround with a slate type hearth, T.V. point, telephone point, wooden flooring and views over the avenue to the front. Attractive range of fitted eye and low level units, tiled between the worktop and the eye level units, single bowl and drainer stainless steel sink, electric oven, ceramic hob, stainless steel extractor canopy, integrated fridge/freezer, integrated dishwasher, drawer units, attractive tiled floor, dining area and a door to the utility room. With a range of fitted units, single bowl and drainer stainless steel sink, tiled splashback around the worktop, larder unit, plumbed for an automatic washing machine, vented for a tumble dryer, extractor fan, tiled floor and a partly glazed hardwood door to the rear garden. Gallery Landing Area: With a shelved airing cupboard. T.V. point and an ensuite comprising a pedestal wash hand basin with a tiled splash back, w.c, extractor fan and a tiled shower cubicle with a mains mixer shower. The size includes a built in wardrobe. Comprising a ceramic bath with a tiled splash back, w.c, pedestal wash hand basin with a tiled splashback, extractor fan and a tiled shower cubicle with a Redring electric shower and a glazed corner enclosure. Attractive brick pavia path and a garden area to the front. Spacious garden area to the rear laid in lawn and bordered by panel fencing. Leave Ballymoney town centre from the Main Street turning right onto Castle Street and proceeding past Tesco and the Milltown shopping Complex. After passing the same continue for approximately 350 yards and take the second right into Bann Meadows. After approximately 50 yards turn left and No. 12 is situated at the top of this cul de sac on the right hand side.